You are here: Home » Take Me Away, Chipotle-Sage Sweet Potato Fries! Take Me Away, Chipotle-Sage Sweet Potato Fries! I can’t decide my favorite combos yet – California lime olive oil with pomegranate vinegar, or mango vinegar with chipotle oil are the current frontrunners – so I’m sure you’ll be seeing lots of cool recipes from me in the weeks to come! Kelsey came up with the first killer recipe, which I cheffed up tonight. 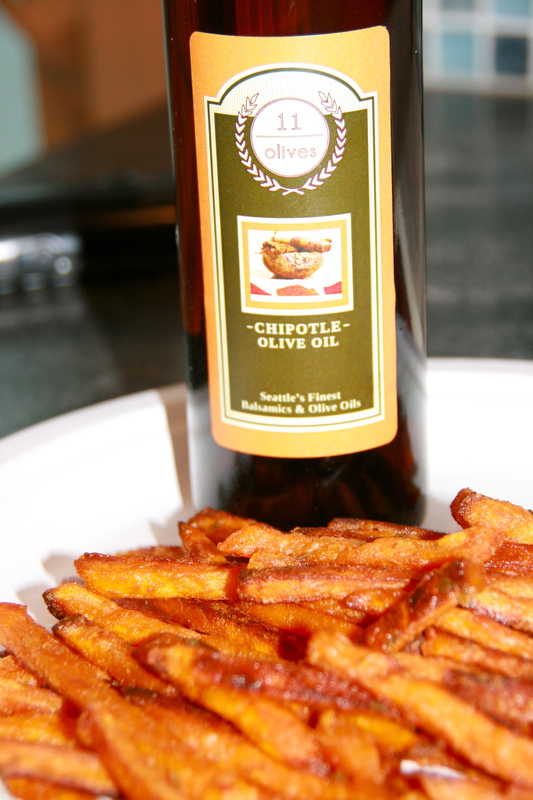 It is delectable: sweet potato fries dressed with chipotle olive oil and fresh sage. The smoky chipotle flavor pairs beautifully with the rich, creamy tasty of sweet potatoes, the sage adds a unique and interesting depth and then there’s the slight kick of heat to finish it off. Oh my…when you try this, it may just sweep you away to that magical land of wondrous flavors and pure happiness. So don’t be surprised if you hear yourself saying: Take me away, chipotle-sage sweet potato fries! Heat oven to 425. Place fries in a large bowl and toss well with sage and oil. Spread in a single layer on a cookie sheet and bake for 20 minutes (or until crispy and golden), tossing a couple of times while baking to ensure even browning and crisping. Serve plain – the flavor is so insanely good that you don’t need any dipping sauce at all. Enjoy! Thanks for the inspiration, Kelsey, and also 11 Olives! Nothing like homemade sweet potato fries! I cook everything with garlic though. Give it a try! Yum, I usually just use cajun seasoning but I might have to try to find some chipotle olive oil – sounds great!! Thanks for sharing! 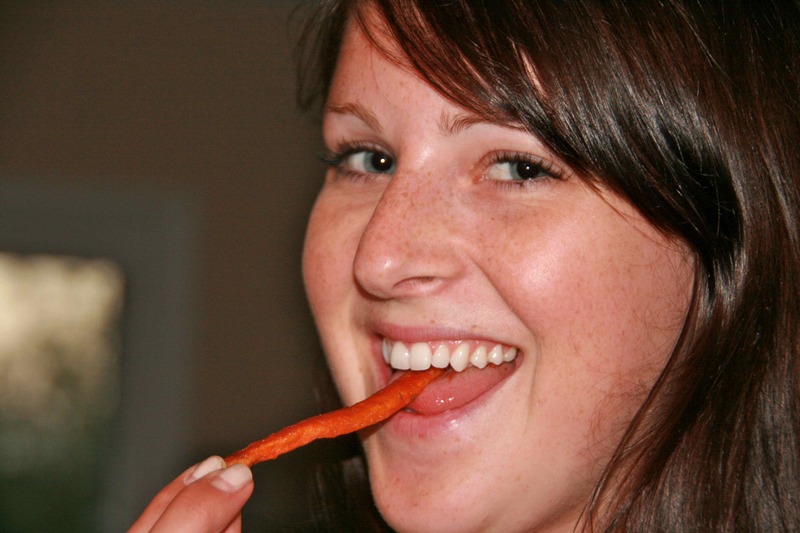 Joe – I’m totally with you: homemade sweet potato fries are the best! I ran out of time last night (and I was kind of in a frenzy to make these chipotle-sage fries once inspiration struck), but next time I’m doing them from scratch. And I also agree with you about the garlic – I dipped the fries in a garlic-cilantro balsamic and they were aaaaaamazing!!! Deirdre – thanks for the kind words! Yes, cajun seasoning on sweet potato fries are pretty delish, but I gotta say that I think they’re even better with the chipotle oil. If you give it a go, definitely get a high quality chipotle oil – I once bought an expensive but blah bottle of the stuff from our local gourmet grocery store and it did nothing for me at all…but the bottle I just got from 11 Olives totally knocked my socks off. It’s sooo flavorful! 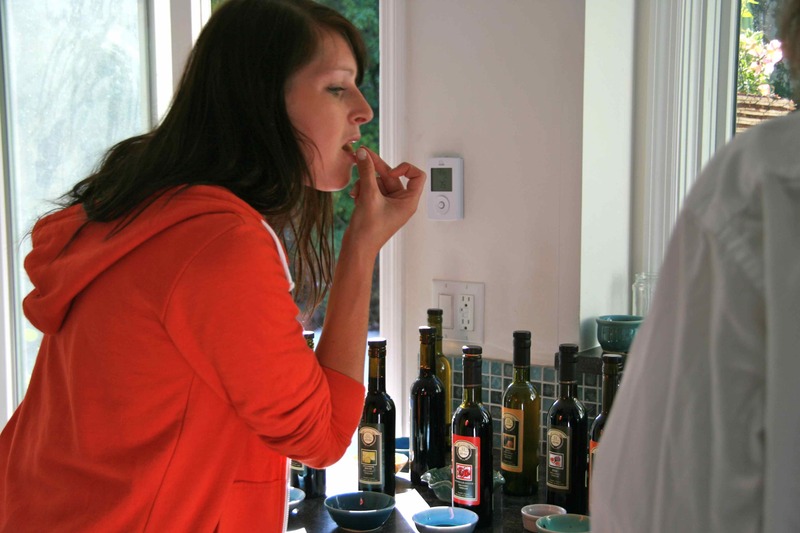 There is no self control when it comes to olive oil and vinegars…did you not know that??!! LOL! !